There is, we all should know by now, a new sandbox for DNA geeks to play in. It’s called DNA.Land, and it’s a not-for-profit crowd-sourcing research site run by the Erlich and Pickrell labs affiliated with Columbia University and the New York Genome Center. Free means we don’t pay for this, it’s for us to play in and contribute to, without costing us a penny out of our pockets. In other words, these are early days at DNA.Land and there are going to be a lot of rough edges. Case in point: the relative-matching algorithm (where they match up our raw DNA results that we upload to those of others to see who matches whom) combined with the imputation algorithm (where they are trying to fill in the gaps in our raw DNA results by statistical analysis that puts the most likely alleles into our results). For the latter, the site uses the example of seeing B _ _ _ C K O _ _ M _ and being able to figure out it means Barack Obama. I have uploaded my own results from Family Tree DNA (as Judy Russell) and from AncestryDNA (as JG Russell). Neither of my uploads reflects the other as a match (which is probably a good thing). But it’s pretty clear there’s more to be done if one set of raw data from the same person has matches — and the other doesn’t. Which brings us back to the first point here. This is free. And it’s in beta. I am not going to complain one bit about this sort of early problem. I’m going to point out this issue, in the hopes — indeed, the expectation — that it’s exactly this sort of anomaly that the team at DNA.Land needs and wants to know about so that, eventually, the site is out of beta and on to being an excellent sandbox for all of us to play in. These are the joys of being an early adopter. And needing to develop patience is one of them. Yep, it’s currently majorly buggy. 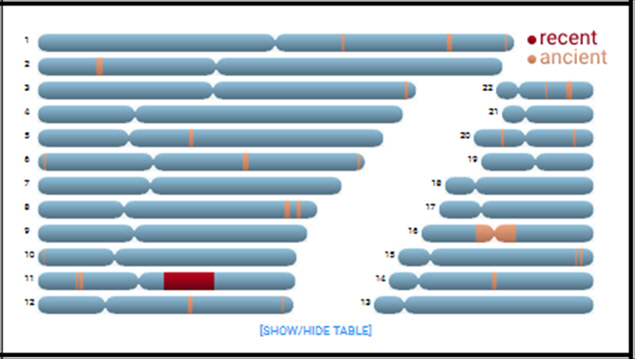 I have uploaded 3 genomes: 2 from me (FTDNA and Ancestry) and one from my mother (23andme). Not a single one of us has matches yet. Thanks for that reminder Judy. Adding my two tests to the mix – maybe I’ll find myself! Thanks Judy and Wendy for trialling this new site. Why is the imputation algorithm necessary anyway? GEDmatch doesn’t require it. However, if there is one, presumably the more test material it has for training, the better it should get. In part, I suspect that the imputation is to see how well imputation can be done! Remember, this is citizen science at its best, and the science boys hope to learn a lot from this. The way I understand it is imputation allows the project to infer the identities of gene variants that were not tested, filling in gaps on markers and giving a fuller picture of genetic health and heredity of specific sets of markers. I’m intrigued to see if it works so I went ahead and uploaded my info. Judy, I don’t have any matches yet either. I’m doing my best to be patient as they program and get additional data/fixes pushed out.